But, if you’re still fighting, treating or otherwise chasing it, here's why you can stop right now – You're chasing a ghost – A sacred "ghost cow." Medical researches first started finding evidence decades ago that the original persistent or Chronic inflammation / “Tendonitis” theory on Tennis Elbow was incorrect. And therefore should not be classified as TendonITIS, EpicondylITIS – Or anything ending with “ITIS” that would suggest an inflammatory condition. “As orthopaedic surgeons, we are besieged by myths that guide our treatment of lateral epicondylitis, or "tennis elbow." 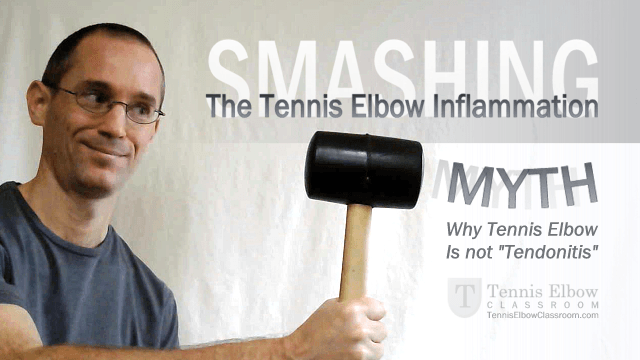 Lateral Tennis Elbow: "Is there any science out there?" - J Shoulder Elbow Surg. By writing prescriptions, making therapeutic recommendations and performing treatments based on it. “Most currently practicing general practitioners were taught, and many still believe, that patients who present with overuse tendinitis have a largely inflammatory condition and will benefit from anti-inflammatory medication. Those burning sensations, that achy, swollen feeling, and the occasional jolt of searing pain would lead any sensible person to think that there must be inflammation in there somewhere! The symptoms, in this case, are extremely misleading and rest assured there’s nothing sensible or straightforward about Tennis Elbow. What researchers started discovering decades ago (and I’m only citing a fraction of them) is that inflammation is actually missing in action (most of the time) and there’s a sneaky, insidious degeneration process going on in the tendon, which, I’m sorry to have to say, is a lot worse than a little inflammation. “Numerous investigators worldwide have shown that the pathology underlying these conditions is tendinosis or collagen degeneration. …One factor that may interfere with optimal treatment is that common tendinopathies may be mislabeled as tendonitis. These past couple of years I’ve been encouraged to see more and more correct references to the true nature of Tennis Elbow in the mainstream, by Gretchen Reynolds, in the NY Times, for instance. That's a big change, BUT, they talk about the need to "reduce it" on at least one page, and they STILL recommend ice, anti-inflammatories and Cortisone shots in several places. Mixed Medical Messages - Is My Tennis Elbow Inflamed Or Not!? "Even though inflammation isn't usually present in long-term (chronic) tennis elbow..."
"To reduce the pain and inflammation of tennis elbow, try:"
Not a big surprise. There is clearly still widespread support for this inflammation fallacy out there. Not Just Chasing A Ghost And Wasting Time - But Worse: Interfering With Your Healing Process! Still encouraged to ice repeatedly, rub lotions and creams all over your elbow, take ridiculous amounts of anti-inflammatories – and then resort to painful Cortisone shots if the first two interventions don’t banish the ghost. That’s not to say that these treatments don’t work. They do often work very effectively – When it comes to relieving, or should we say, “suppressing” symptoms temporarily. Although those seemingly innocuous pills can be pretty harmful, too, when taken for weeks on end. To top that off, neither your Doctor nor the medical websites will tell you the simple fact that inflammation is a natural and necessary part of your healing process. Which means you’re essentially trying to stop your own healing process! You see, any time there’s injury to tissue, including muscle, tendon, skin and bone, inflammation is the first stage of the healing process – Without it there is no healing. So, don't risk harming yourself with pills, ice and shots attempting to chase away something that isn’t even there in the first place – And which you actually NEED! But don't be too hard on yourself if you didn't have a clue about any of this until now, and you've been following the "common wisdom" and the advice everyone's been giving you about "reducing" your inflammation. How bizarre is it to find out that inflammation is something you didn’t know you wanted, because you can’t have healing without at least a bit of it! I want to first state that my extensive history of dealing with tennis elbow in one and often both of my elbows, because of golf, and on one occasion, carpentry work, over 15-20 years, has lead me to believe that I suffer from tendonosis, not tendonitis (per your diagnosis). You helped me cure the tennis elbow in my right elbow last year, and while I had to go to a PT for my left elbow, I still believe whole-heartedly that it was the hands-on physical therapy that cured me, not any anti-inflammatory therapy (I didn’t do much). I’m not emailing you because I’m not convinced. I believe that your ideas on the cause of TE are correct. I know I’m being a little nit-picky, but I think it would be more accurate for you to stress, not that TE doesn’t **involve** inflammation, but rather that it isn’t **caused** by inflammation, and that it isn’t cured by making the inflammation go away. From my perspective, it clearly does **involve** inflammation. I had a cortisone shot once, and it clearly made the pain go away (for a week). I have a golf buddy who is regularly getting a cortisone shot (to my chagrin), and he does this because the shot definitely affects his TE (I’ve forwarded your article to him). Well, that’s my two cents worth. Keep up the good work. My big point with icing is not to do it over and over every day thinking that it’s going to “reduce inflammation” and somehow help the injury heal. For simple pain relief when you need it, it’s fine in moderation. Have you put together programs for DeQuervain’s and Trigger Finger the same way you have for Tennis Elbow? I treat Trigger Finger in my office but I don’t have videos for it yet. (Sorry about that.) No. I don’t think splinting is appropriate for any chronic tendon problem.